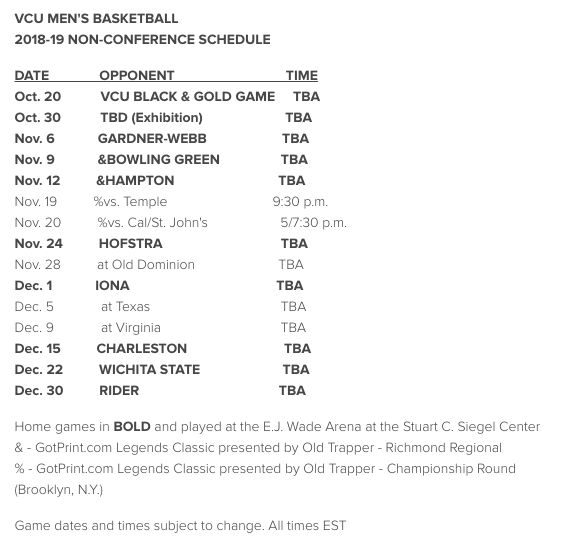 On Thursday, VCU Men’s basketball released their 2018-2019 non-conference schedule. Among notable dates are a December 5th trip down to Austin, Texas and then up the road to Charlottesville on December 9th. These games aren’t a surprise to Ram fans but now they finally know the dates to circle on their calendars in hopes of avenging two losses from last year. One loss from former coach Shaka Smart and the Texas Longhorns and against the #1 overall seed from last year’s NCAA tournament, the Virginia Cavaliers. Both games are the 2nd half of a home-and-home agreement. December 22nd will mark the start of a home-and-home series with Wichita State. This season, the Shockers will travel to Richmond. Next year, VCU will return the favor. Below is the full non-conference schedule. You can read the full release from vcuathletics.com.